Kathmandu is one of the fastest growing cities in South Asia, and the rapid transformation of the metropolitan area of the Valley over the past decades has been dramatic – especially in the reduction of the green spaces. Nepal’s capital today ranks as among the most congested cities in the world, bringing with it a slew of other environmental problems like air pollution, garbage, etc. The most emblematic evidence of this decay is the Bagmati River. Along with its tributaries, the river is a key landmark, the artery of the Kathmandu Valley civilisation. But what used to be a living river with clear water flowing across a sandy flood plain a few decades ago has been reduced to a smelly sewer. The city’s citizens have spontaneously started a cleanup campaign. To add to the work of volunteers picking up solid waste dumped on the river, there needs to be a vision to transform the banks of the Bagmati, and give the river back to the citizens so they can bond through green, human and cultural connectivity. A proposed masterplan to revitalise the Bagmati and the city includes building a green belt along the river banks from Manohara to Bishnumati to promote bicycle and pedestrian traffic which will reduce both congestion and air pollution, providing a completely new way of moving around the city for both commuting and recreational purposes. A Bagmati River Park along a 5km stretch of the river separating Kathmandu and Patan will bring green public space to where the city needs it most. The unique area is carefully designed to include wilder areas inspired by Nepal’s biodiversity and vegetation types, as well as more traditional park space with promenades, intimate space to escape from the city’s bustle, as well as bigger places for cultural gatherings. There will be areas for both organised and spontaneous sports activities in the city’s new green lung. Since the park area already has important temple complexes like Shankhamul, Thapathali and Teku which were once sacred to pilgrims, but have been neglected and allowed to decay a heritage walkway along the Bagmati Park is proposed to reconnect the people with their temples and preserve festivals and the cultural heritage. Such a holistic approach to urban planning taking rivers into account have been seen in cities around the world. They have rejuvenated urban areas, and the banks have revitalised communities. Kathmandu already has many local initiatives but as the nerve centre of urban life, the city needs a braver plan with wider metropolitan perspective capable of leading the way to future development. With the first elected mayor and new ward members in 15 years, the time is now. There are cities that have changed completely by starting large urban greening projects. These have not only benefited the people who use it every day, but also helped rebrand cities and promote tourism. Greening the Bagmati can have a far-reaching impact to bring not just the river, but the city and the Valley back to life. 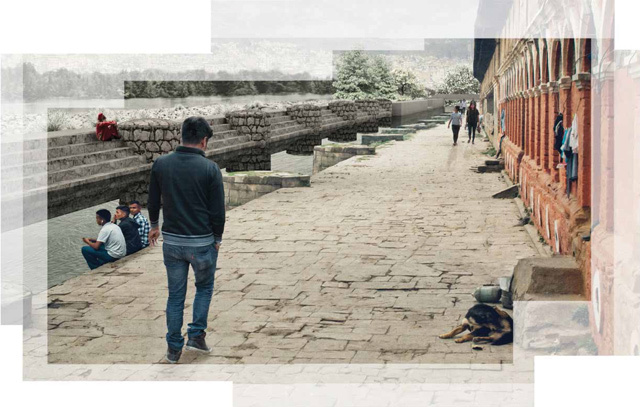 This proposal for a Bagmati River Park is part of the masters thesis Healing Bagmati written by two Danish students, Oskar Frelin and Jens Hansen Holm who spent several months in Nepal in 2016. Illustrations on this page are from their thesis, which can be viewed in full on http://www.healingbagmati.com/. The proposed Bagmati River Park will be a green membrane for the stretch of the river from Manohara to Bishnumati that will use the river as a major artery for the urban transformation of Nepal's capital. Kathmandu and Patan have merged into one metropolitan area, and the Bagmati River between them has been treated as a barrier, the space neglected and misused. The restored riverscape (left) can resurrect Kathmandu by giving the waterway back to the people. The Park will fill a void in the heart of a divided city and help reorganise the urban fabric of Kathmandu and Patan, becoming an anchor for the transformation of the twin towns. The Park will create a new identity for Kathmandu, charting out a bold move towards a greener path to urban planning and development within its historical context. Kathmandu is overbuilt, and the Park will offer calm areas where people can rest, relax and recharge. The banks will be filled with trees, shrubs and plants. The unused space can be turned into an air purification area. The rest of the riparian stretch will change from a wasteland to a recreation space. The Park will use the river to reconnect citizens, connecting them to nature and their cultural heritage. The Park will make urban greening along the river banks denser, and connect to existing open spaces so that the river becomes a green corridor. It re-stablishes the natural aquatic habitat and the banks acts as a green lung for the city. The river and its banks can become the urban green infrastructure by promoting walking, bicycling, relieving the city of traffic pressure, giving citizens a healthy transportation alternative and add new space for social interaction. The Bagmati and its tributaries are the site of many places of religious significance, ghats and temples which will be connected by the river with a cultural ‘temple walk’.